OEM / ODM | Goshu Yakuhin Co.,Ltd. Goshu is an OEM / ODM company that not only manufactures and sells our own products using of natural water and deep sea water, but also contributes to customers through high value-added proposals. We have offered OEM / ODM water products, bath additives, cosmetics and food with beneficial claims to various companies. And now, our OEM / ODM business is expanding throughout the world with a diversity of customers. Goshu’s ODM / OEM is conducted from design, development to commercialization on a streamlined basis. We can make customers' images and requests into actual products accurately and smoothly. In addition, production will be implemented at our factory in Japan where we have obtained ISO 9001 and FSSC 22000 certification. We deliver reliable quality. Goshu’s OEM / ODM products are used raw materials natural water and deep sea water in Toyama, Japan. 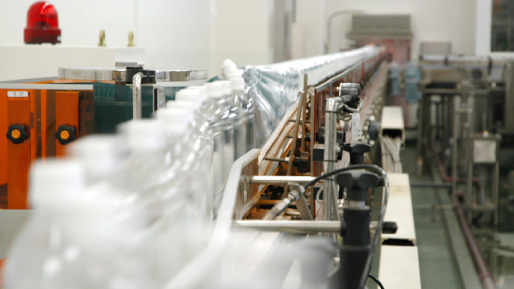 Natural water is taken from a water source in the factory premises and bottled in fresh condition. Deep sea water is refined into water, salt and minerals using our original safe and clean desalination separation technology. We use it as raw material for our products. Starting from our basic research to efficacy, effects, manufacturing method investigation, and the latest research. 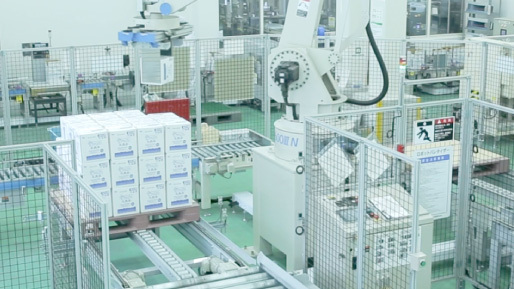 Our dedicated research and development staff with advanced skills and passion is working on product development every day to deliver high-quality OEM / ODM products that satisfy our customers. We have abundant OEM / ODM records accumulated since our foundation in 1946. We also offer a variety of evaluation, analysis and testing machines which can objectively measure safety and effectiveness of the products, and it is possible to develop original products with market competitiveness based on scientific evidence. We have staff who can speak English and Chinese at Goshu. We can respond to inquiries from overseas companies with no problem. 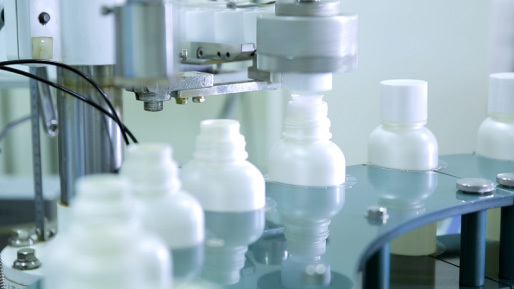 We will also deal with consultations from domestic companies who are considering developing original mineral water, bath additives, and or cosmetics for overseas markets. Our main factory "Chisato Plant" 8000m2 surrounded by beautiful nature with clear sky and green views. The reason this place was chosen is that it is close to a water source with high quality natural water. In the vicinity, there are areas designated as Toyama natural environment preservation and historical sites. We are making products while with protecting beautiful scenery and the environment. 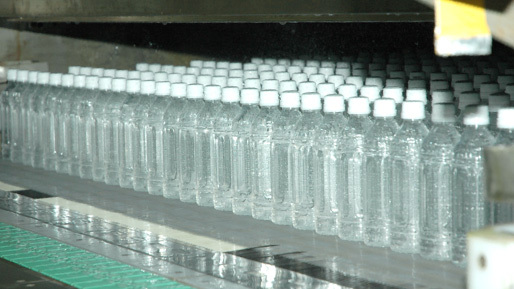 OEM / ODM manufacture of various water products is available. - BIB (Bag in Box) / 6 L to 11 L, 20 L, etc. 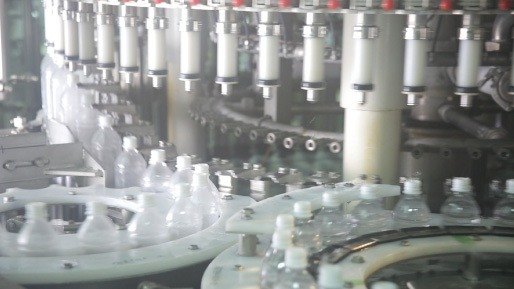 Our filler is compatible with various PET bottles equipped with high-speed filling lines and multi-bottle compatible lines. 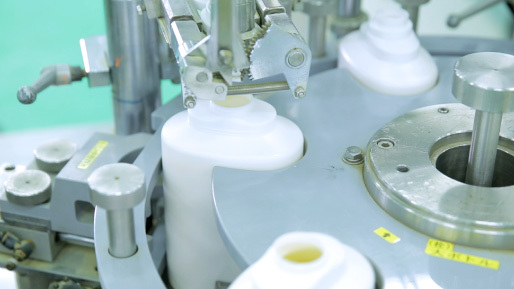 The high-speed filling lines have acquired ISO 9001 certification. 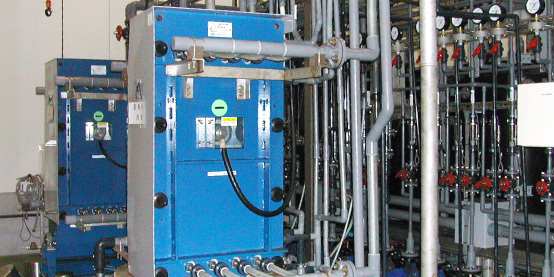 The water is filled by a heating filler with equipment boasting one of the largest filling capabilities in Japan. 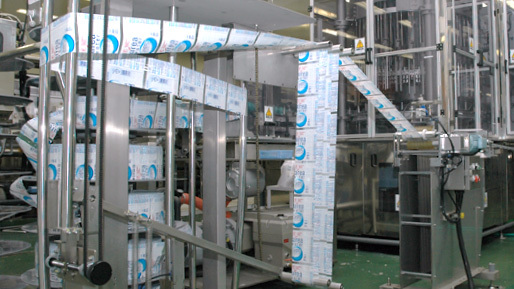 After filling, the bottles are on the tilting conveyor to sterilize the caps and other parts. Inside is divided into 4 tanks, and the bottles are cooled step by step to not to affect the bottles. 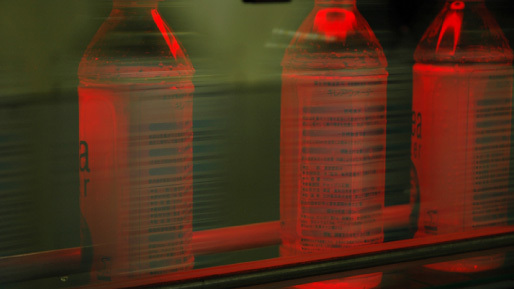 High-speed labeling matching to filling speed is possible. It also can respond to the arrangement of the label sizes. It does an appearance inspection of all items at high speed and with high accuracy using special equipment. A wasteless, fast and reliable casing is possible. 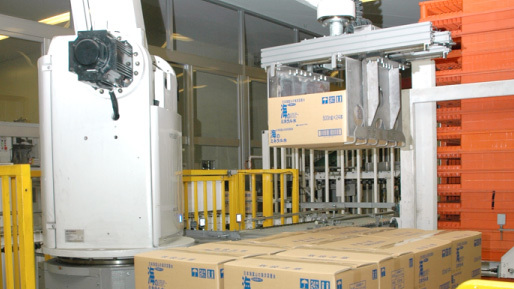 Packaged products are stacked on a pallet by a robot with paste on the top of the boxes for collapse prevention. Under the control standard of FSSC 22000, we are making products that customers can assure. 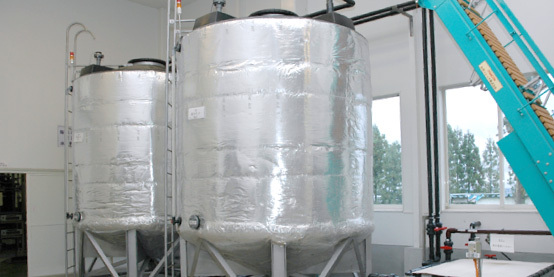 Sterilized water is filled at 130 ° C or higher in the clean room. Filled bags are inserted into the boxes. 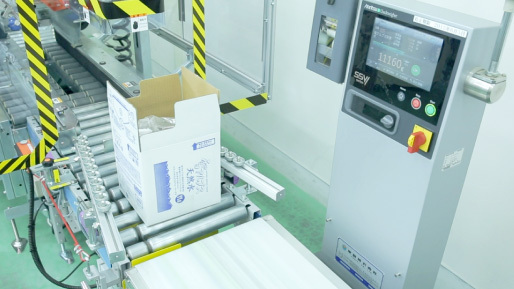 The total number of boxes is inspected with the weight checker so that the filling amount is within a specified standard range. 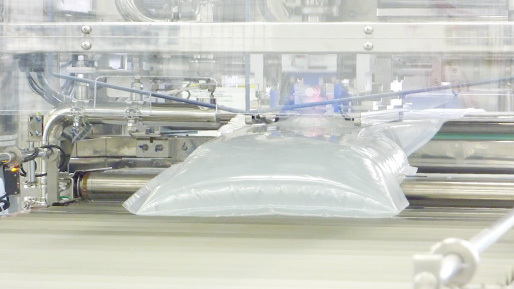 It can palletize at high speed without damaging products. 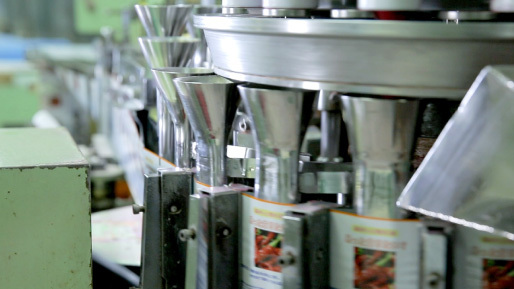 We will offer original products according to customer’s request in ingredients, shapes and packaging. This machine can fill powder type additives or grain salt type additives mainly around 25g to 35g. We propose the optimum film according to the type of filling such as aluminum film excellent in preservation, aluminum vapor deposition excellent in flexibility, PET resin etc. 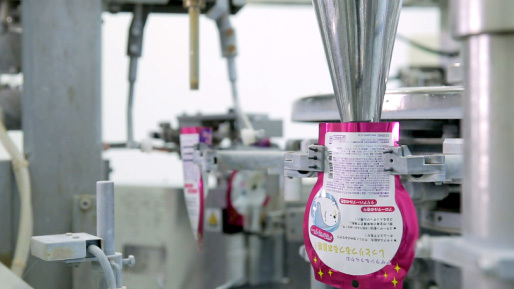 This machine can automatically fill the additives according to customer's needs as long as it is within a certain standard of bottle shape or cap size. After removing the static electricity of the bottle, it completely removes the dust and dirt in the bottle by air. By filling with piston method, it can correspond to filling of high viscosity material. As long as the container has a filling port inner diameter of 10 mm or more, the machine can fill any container. Stable ratios for the two-layer type material can be maintained by filling with stirring. 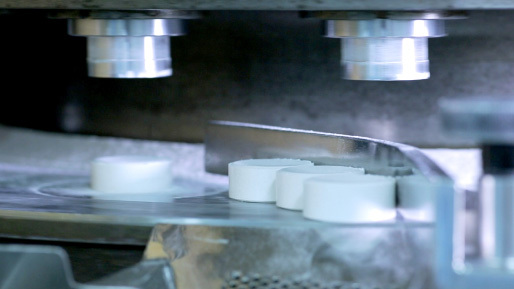 In a space where room temperature and humidity are kept constant at all times, tablets with the size of around 4cm in diameter and around 25g are pressed with appropriate pressure according to the bath additives. 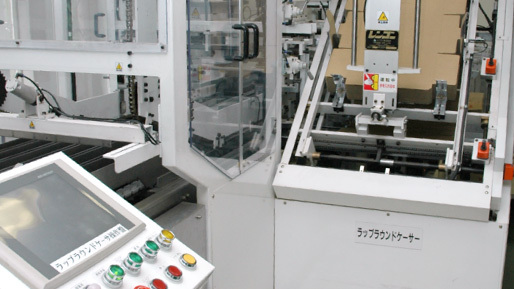 This machine can fill an irregular shaped package such as a character shape, etc. It is also applied to the two-agent mixed bath additives such as salt and oil. At our plant, deep sea water pumped up from Toyama bay is separated in (1) desalinated water (2) mineral concentrated water (3) concentrated salt water (4) salt and (5) bittern. The deep sea water which has been carried from the intake plant is filtered and stored in a 10 ton tank with a cooling device. 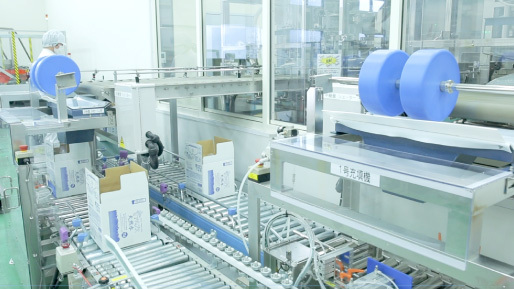 In the first stage, the sea water is divided into fresh water and mineral concentrated water, and in the second stage mineral concentrated water is separated into concentrated salt water and mineral water. - Granules / Various arrangements are available such as to intake as it is and to dissolve in water to make a drink, etc. * It is also possible to order OEM products with prescription with specific ingredients omitted considering reasons such as health, ethics, religion, etc. Please contact us for more information. What kind of products can Goshu make? We can supply water products, bath additives products, cosmetics and food with beneficial claims using natural water and deep sea water. How long will it take to produce a product? In the case of new product development, please consider about 6 months from the first meeting to product completion. Can I observe the factory? Yes. 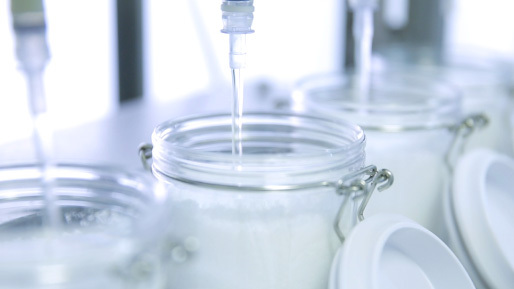 However, it may cost for prototyping prior to formal request or prototype at laboratory level. Can you consult with the package and label design? We can propose original designs by our design staff. Can you support OEM for overseas products? We mainly support OEM in the ASEAN region. Please contact us for more information. Can you act on behalf of export procedures? We can support documentations that necessary for procedures (eg. MSDS, INCI name and manufacturing certificate),However, any preparations neccesary at importor's country are recipient's responsibility. eg. Serches for any regulations and laws of importor's country to prepare documents and pre-applications to pass the customs clearance and to sell under the official certificate from their country. bath additives, cosmetics and food with beneficial claims using natural water and deep sea water, please contact us.